The following side-by-side table enumerates the many properties of the various Spotmatic-family of cameras. As the Spotmatic evolved from a basic SLR with a TTL meter, it took on different characteristics. It was offered in a meter-less version (the "SL"); stripped versions without self-timers, a limited range of shutter speeds, and base lenses (Sp500 and Sp1000); increasingly sophisticated versions of the original Spotmatic (Spotmatic, Spotmatic II, IIa, and F); and finally a run of electronic, automatics, the "end" of the M42, screw-mount cameras from Asahi (The Electro-Spotmatic, ES, and ESII). Within each of these ranges, are numerous smaller variations. For example, the early Spotmatics had different external (most visible are the self-timer lever, meter switch, top cover attachment method, and film counter height) and internal features (shutter, meter, and other mechanical changes) than later Spotmatics. These important but constantly changing variations are largely left unaddressed in this table. 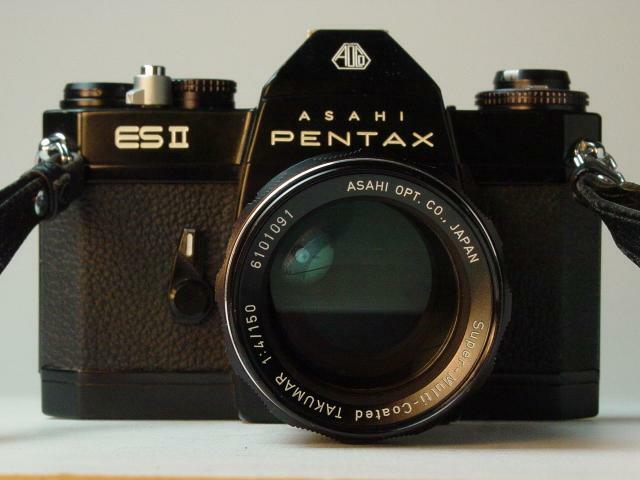 The specifications cited in this table are derived from Asahi Pentax publications and verified with first-hand observation. Over a period of nearly 30 years, Asahi Optical Company were remarkably consistent in the data published about their products. I have found it to be precise, consistent across various company sources, and most often cited in the same manner. This has made it possible to compile this data with a high degree of confidence with regard to its accuracy. One particular area of data that is vexing is that Asahi cited weights and dimensions based on the "standard" lens. However, until the early 1970's, they offered two "standard" lenses on their cameras yet only quoted one weight with standard lens... It "looks" like they were speaking of the 55mm f/1.8 or f/2.0. But they changed mid-stream... If you are really concerned about the weight of a particular camera/lens combination, go weigh it! Entries with numbered superscript notation have additional comments below. 1 Electro-Spotmatic and ES Super-Takumar lenses featured open-aperture metering index lug, aperture simulator and Auto/Manual lock pin, but were not Super-Multi-Coated. 10The hot shoe flash contact turns to "hot" (switched on) only when you insert a shoe-mount electronic flash. It remains cold (disconnected) even when using an electronic flash with its cord plugged into the X terminal on the body front. This eliminates the danger of electric shocks. The "subjective" questions that I asked about meter sensitivity (in low light, of course) and finder brightness are not going to be found in the literature. The goal of the work I did was to capture the documented "technical" differences. I don't expect to include brands outside Pentax in this table. In fact, though I have data for several predecessors of the Spotmatic and though it would be interesting to include that data for comparison, I felt that would take it away from being a Spotmatic focus. I made a conscious effort not to include subjective assessments; I can say that a meter has a specified range with more confidence than I can say I think this meter works better in low light than another. For example, my experience with the Spotmatic F's that I own leaves me very unhappy with the meter in low-light situations - it actually goes off rather than give me a reading. But that's pretty well covered by saying the EV range because if I take a hand-held meter that shows EV, I can translate that to something specific, rather than just have a general expectation of low-light limitations. As far as the engraving, I believe that would be nearly as comprehensive as the technical specs to document and could well take another table. And so with S/N ranges. The table does not substantially differential small differences between cameras of the same model designation. As these fall under the running and regional changes that I allude to in the lead-in material, I didn't cover it, though it is very compelling and useful in it's own right. I don't think finder brightness is something that can be described in very reliable objective terms without instrumentation and a large set to use for measuring and averaging. I believe we observe that the finder brightness increases as a function of evolving models. 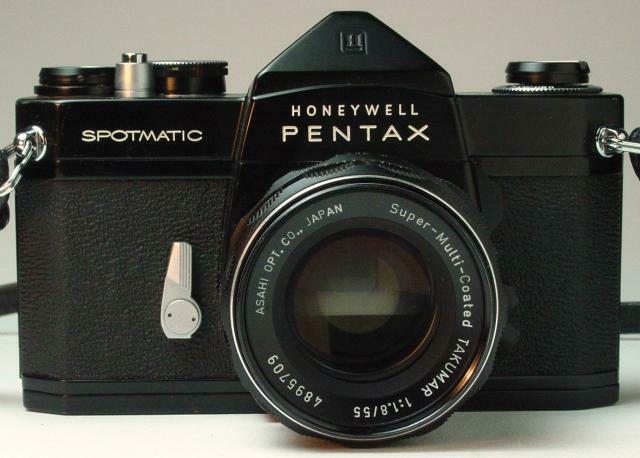 That is to say the early Spotmatics are darker than the later; the Spotmatic II's are darker than the Spotmatic F, etc. But I believe the difference across Spotmatics to be relatively small, so again, it's not that easy to quantify or meaningful to report. It cannot be independently assessed and "fixed" by all observers. The meter sensitivity row is pretty flat but it does highlight the issue with the Spotmatic F. Also, remember, there are the ASA range, and in the case of the Electro-Spotmatic, ES, and ESII, other indicators of meter properties. This gets the user into the realm of composite data. Here again, I have not done any A + B = C columns because it may be somewhat subjective. But the dedicated observer may make some conclusions using a combination of fields. I have enough different M42's and K's to realize that there can be a marked difference in finder brightness as well as microprism quality, and as you know, I favor the Fujica ST701 for that very reason. The chart does not span to cover cameras outside the Spotmatic Family. Example - my spare Spot body for sale says "Honeywell Pentax" on the front, "SPOTMATIC" above the self-timer on the top front chrome, and 1/1000th top speed. S/N is 1042441. There is no shoe on the top. Your image of the SP1000 does not have "SPOTMATIC" on the front, so that's not the model. 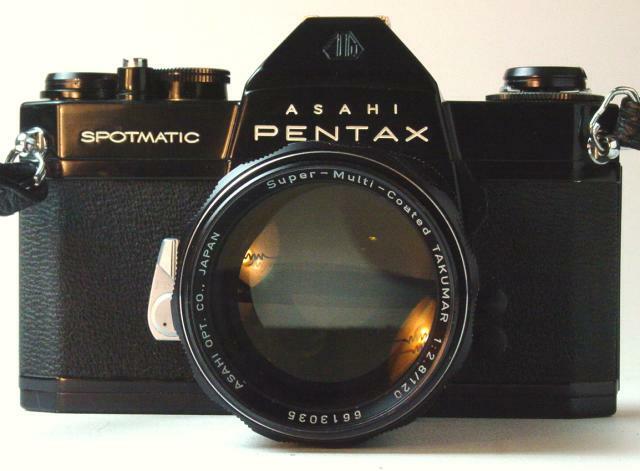 Closest resemblance would be the "Asahi Pentax Spotmatic", rather than Honeywell, with a different name. The other item that would be handy would be some kind of reference by serial number ranges. Dario has "years of production" on his site, so perhaps you could work something out to integrate that. More Pentax cameras, lenses and accessories for sale! Check out our store for everyday items with Pentax Camera images on them! Click or the [ BACK ] button on your browser to return to the previous page. Photos, Layout and Design © 2006 Paul M. Provencher All Rights Reserved.